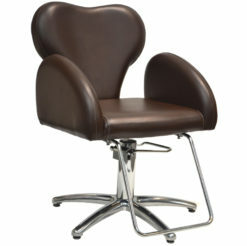 Model 6106 Barber chairs with reclining back cushions and adjustable headrest on heavy-duty hydraulic base. Upholstered leg panels lift as seat reclines. Categories: Seating, Barber Brands: Paragon.